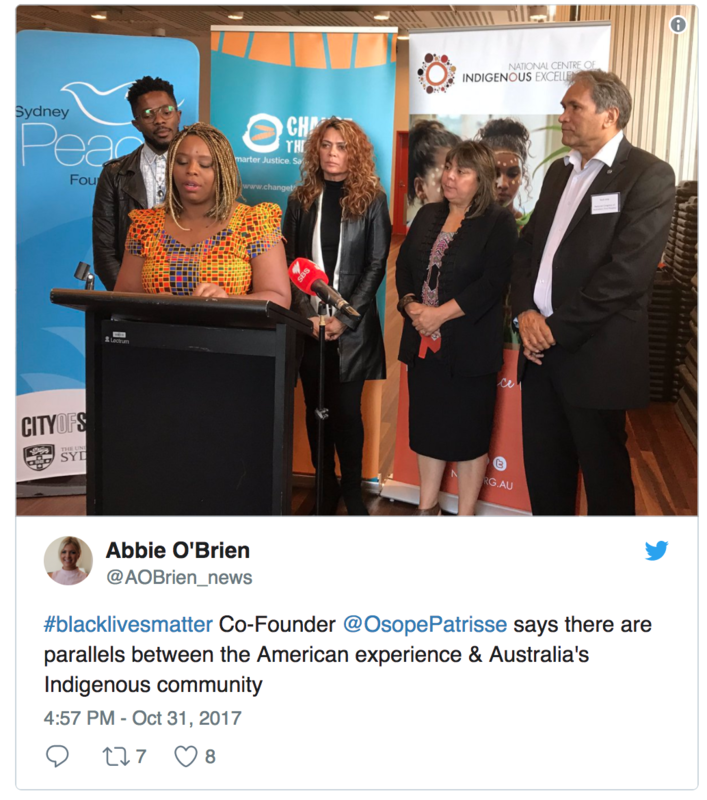 The co-founders of the global Black Lives Matter movement have met with Australia’s Indigenous community and say there are parallels between the experiences here and in the United States. Since it began in 2013, Black Lives Matter has been on the frontlines of protests across the US, leading the fight against police brutality and high incarceration rates among the country’s black community. Driving the now-global campaign is its co-founder, Patrisse Cullors, who says the struggle is not unique to the US, citing the experience of Australia’s Indigenous community. “Similar poverty rates, similar mass incarceration rates, the deaths in custody that are being swept under the rug – these are all things we feel in the US so there is a deep affinity around this resistance and this struggle,” she said at an event in Sydney on Tuesday. Ms Cullors is in Australia with her Canadian counterpart, Rodney Diverlus. They are here to accept the 2017 Sydney Peace Prize, Australia’s leading award for global peacemakers. It marks the first time the prize has been awarded to an organisation rather than an individual. Mr Diverlus says the visit has another purpose. “I think it’s time for us, as brothers and sisters, to stand together in the global fight,” he says. The pair will be meeting leaders and advocates from Australia’s Indigenous community. “What I am excited about is meeting the Indigenous communities here that are fighting, that can see victory in sight and I think that’s powerful,” said Ms Cullors. 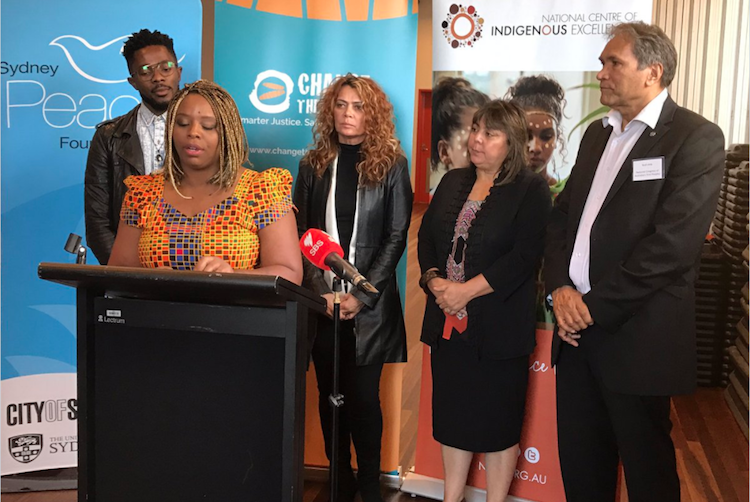 Cheryl Axleby is the Co-Chair of the Change the Record Coalition, which calls for urgent action to close the gap in imprisonment rates between Indigenous and non-Indigenous Australians. She says discussions are looking at the challenges faced by Aboriginal and Torres Strait Islanders, not just in the Australian context but from a global perspective. “Having our brothers and sisters here is going to give our communities great insight in what they’ve been doing in their own countries and to look at what we can do from here on,” she said. Antoinette Braybrook, also a Co-Chair of the Change the Record Coalition, says the two communities will be exchanging ideas and experiences. Nathan Moran is the CEO of the Metropolitan Local Aboriginal Land Council. He’s hoping the support of the Black Lives Matter campaign will add momentum to the Australian movement. SPF acknowledges the Gadigal and Guring-gai people of the Eora Nation upon whose ancestral lands we stand. In the name of Peace with Justice the Sydney Peace Foundation stands in solidarity with Indigenous people’s right to determine their own future. This includes but is not limited to their right to active participation in all decisions made by Australian governments in regards to land, welfare, regulation, education and cultural practices. We acknowledge the value of different ways of knowing and being in the world, and we look to Indigenous Australia for ways that they can educate us on respecting, caring and sharing the land on which we live.